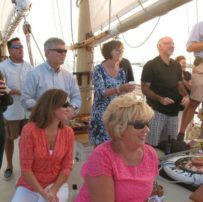 Corporate outings sailing on the waters off Newport are the ultimate corporate event experience. Relax with coworkers, host a summer office party, reward your top performers, entertain clients, or simply sail and take in the sights when the big meeting is over. We’ve been hosting company outings on the water for years. Past corporate clients include: Adidas, Boston Beer Works, Blue Cross, Hasbro, Harvard University, Black and Decker, Morgan Stanley, Shields Healthcare, Taco, FM Global, Deloitte Touche, Morgan Stanley, Price Waterhouse Coopers and countless others. Guests may take the helm and steer, raise sail and turn winches or sit back, relax and take in the sights. No sailing experience is required on our company outings. 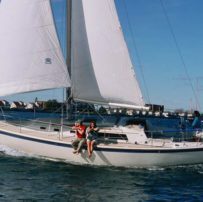 Aquidneck and Sightsailer are our two most popular sailing vessels boats for corporate events and private sailing charters. 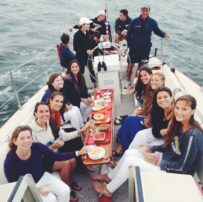 Aquidneck sails with a maximum of 49 guests for private charters while Sightsailer sails with a maximum of 13. Both boats are specifically designed to take guests sailing and are comfortable, clean, well maintained and operated by professional, licensed captains and crews. All of our crews love to sail and it shows! More information about the boats is in the Our Fleet section. Food and drink are permitted on private charters and can be easily arranged. 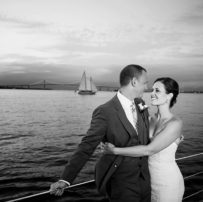 We have special yacht charter menus provided by several excellent local caterers that we’d be happy to share with you. For beverages we suggest Vickers’ Liquors who offer free delivery to the dock with no markup. See our FAQ section for additional info on food and drink. Sightsailing is located on Bowen’s Wharf, less than a 10 minute walk from all the major hotels and inns in downtown Newport. Bowen’s Wharf is a historic wharf and the heart of the waterfront district with many excellent restaurants close by. 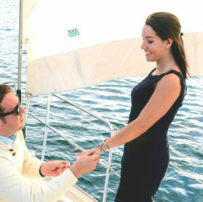 Other pickup locations include the Newport Yachting Center, New York Yacht Club and Conanicut Marina in Jamestown. 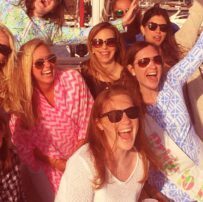 For more information or to book your corporate outing aboard one of our boats, please submit a Private Charter Inquiry Form or Contact Us.